The very same dynamic exists between R(Roberta). A(Ann). 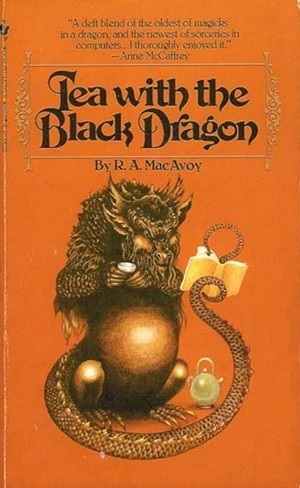 MacAvoy’s classic Tea With the Black Dragon and what is one of my favorites of my own books, All the Gates of Hell. The influence and connection may not be that easy to see. You’ll note that the premises do not even touch at any point save one, and I’ll get to that: In TWTBD, an older woman named Martha MacNamara discovers that her computer programmer daughter has gotten involved with some dangerous people and has since disappeared. In her quest to find her daughter, Martha meets and befriends an Asian gentleman, Mayland Long, who just might (spoilers!) be an ancient dragon in human form. In ATGOH, a young woman in a contemporary city discovers that she’s the human incarnation of the Buddhist bodhisatva of Mercy, Kuan Yin, now on the run from what she doesn’t know for reasons she cannot remember. Both do, however, contain dragons in human form. See how little plot/premise actually tells you about the heart of a book? Ray Bradbury once said that “Plot is the footprints left in the snow after your characters have run through.” No argument from me. When I get compliments about how well and tightly a book of mine was plotted, I can only smile, since I never plot anything. No, the reason Tea With the Black Dragon mattered so much is simply for what it taught about another way to approach a book. One thing I didn’t mention above about TWTBD is that Martha MacNamara, aside from being an 1) older 2) woman (rare enough as the main character of a fantasy book, especially at the time), she also happens to be a zen master. This is not just a simple character tag. The plot of the book is often a convenient framework for the philosophical musings that make up a good bit of the dialogue between Martha and Mayland, and to me were what the book was really all about, its heart and soul. As with any story, there’s what happens, and there’s what the story is about. In the best stories, in my not so humble opinion, they are rarely the same thing. So when my former agent dismissed All the Gates of Hell as “an advanced philosophy seminar masquerading as a novel,” I only disagreed on both points. First, I don’t know enough philosophy to create such a seminar, and second, it most definitely was a novel. The one I wanted to write, the one I did write, and the one I knew how to write, in large part thanks to the example of R.A. MacAvoy, to whom I owe a debt of gratitude I hereby acknowledge. P.S. : Currently reading her new one, a collaboration with Nancy Palmer, Albatross: About Quantum Physics, Human Beings and other strange things. I have no idea where this books is going, and that’s the way I like it. Maybe you would too. This entry was posted in novel, Process, Publishing and tagged Andre Norton, R.A. MacAvoy, Ray Bradbury, Tea With the Black Dragon by ogresan. Bookmark the permalink. Tea with a Black Dragon is one of my top 10 books of all time – as is All the Gates of Hell…. interesting (extremely) to hear the connection between the two from you….